A few months back I tried to make something out of an old cookbook of my mama’s; it was similar to this but used polenta and unseasoned ground beef. It was… dismal. So last night I decided to make up my own version. Success! SO tasty and good gravy it smelled amazing. The Yankee ate three helpings for supper; this counts as a thumbs-up, no? That’s it! This is perfect for a quick fall supper that tastes like you put hours of work into it. So warm and filling without you actually having to stand over the stove forever and a day. What’s not to love? Disclaimer: Jiffy cornbread does not know that I exist; I just love the stuff. 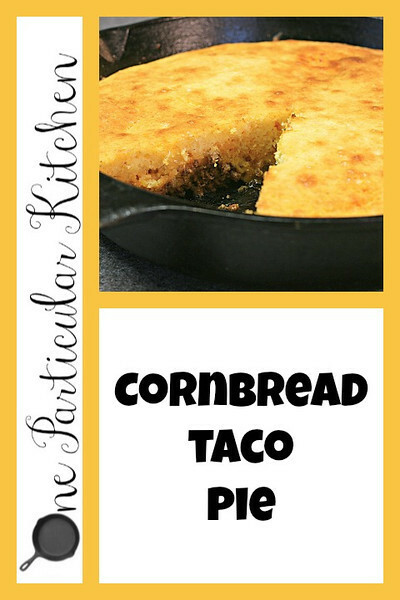 I think I might be trying cornbread taco pic this week! Looks like a great recipe for fall. I freakin’ love Jiffy cornbread! My hubby will love this dish & it’s great weeknight supper idea when I don’t have much time (or energy) to cook! And I struggle with posting food like this, too, the ones that will never look as fabulous as they taste! This recipe sounds amazing! chopped & sauteed onions & jalapenos to the meat mixture. I also added niblet corn, chopped jalapenos and cheese to the Jiffy mix batter. It was delicious. I like spicy, can you tell. I cooked it all on my Big Green Egg. Man was that good. Thanks for the recipe. I added a can of Mexicorn to this recipe for color and boy was it delicious!